Back this summer I picked up a bunh sweaters for cheap at thrift stores to put away for the winter. When I pulled them out to list some in my Etsy shop I realized I had been a little too hasty in my buying and not noticed that this one lovely sweater actually had quite a few big holes in it. I was totally crushed, and just couldn't bring myself to throw it away. It sat in my work room for a few months before it hit me - mittens! 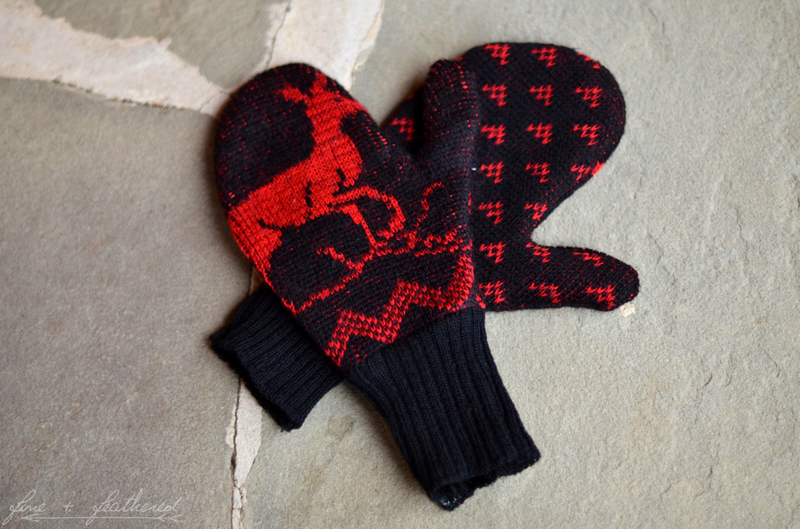 I remembered this post Elsie did about making an old sweater into mittens and decided it was the best way to go. But I did mine a little different since it was really important to me save the cute little deer that were right in the middle of the chest, which meant I wouldn't have the cuff parts like how she did. Start by cutting down the side seams of the sweater so that you have the front and the back in two sperate peices and lay them out flat. Then figure out what part of the sweater you want for your mittens. Trace around your hands and then cut them out (go wide around your hand - you can always sew them smaller but you don't want them too tight!). If you also had to cut out of the middle of your sweater, like me, you'll need to make the wrist bands too. Use the bottom waist band of your sweater, cutting to fit your wrists with about 1/4 for the seam, then cut in half. Sew the one half of your wrist band to the top peice of your mitten (right sides together!) and the other half to the bottom peices, then sew both peices you now have together (once again, right sides!). Repeat for other mitten. You can always try them on once you're done and if they're not snug enough for you just flip them inside out again and sew a little smaller. It actually was pretty easy, even with the extra complication, I just had to take my time and think through everything before I did it, which was hard since I'm pretty hasty with crafts sometimes! Hope this helps those of you who might find yourself in a similar predicament. It's great to have a way to save cute sweaters that get ruined - I just couldn't bear throwing one with deer on it away! If I come across another sweater I need to do this too I'll definitely take some process pictures that way it's a little clearer (pictures are always better, am I right?). Has anyone else tried making mittens into sweaters?